The “mummy-tummy” as it is often referred to, is not just an appearance issue. This stomach bulge is often the result of a separation of the stomach muscles known as diastasis recti. Belly binding is one technique that can help facilitate postpartum healing after childbirth. Just as it sounds, the practice refers to wrapping or splinting your abdomen. Wrapping refers to using a long piece of fabric or wrap to support your core, while splinting offers the benefits of binding in a premade fitted option. In general, splints are medical-grade support tools. There are many different types of splints on the market, so you’ll need to look carefully at sizing and usage guidelines to find your fit. For nine months, your body makes changes to accommodate the human you are growing. During pregnancy, your body releases different hormones—such as relaxin—that help your ligaments and muscles soften in preparation for childbirth. Your abdominal muscles are joined by a connective tissue that runs vertically from the sternum to the pubic bone. This tissue stretches and weakens as your uterus grows. While all new moms may not suffer from diastasis recti, every postpartum mother will experience some stretching in their abdomen. Belly binding is a centuries-old tradition that spans many cultures. It not only helps retrain core muscles, but it also helps correct your posture while you carry or breastfeed your newborn. Binding can help the uterus shrink and the compression from the wrap aids in flushing out postpartum bleeding. Belly binding has also been linked to dissuading the “baby blues.” You can start binding your core immediately aftera vaginal birth and 7 to 10 days after a cesarean. As you should with any part of your recovery, always consult your doctor or healthcare specialist. It is important that you give your body the same time and space to recover as it took to grow your baby. While some women do report that wrapping helps return them to their pre-pregnancy body quicker this is not the goal of belly binding. 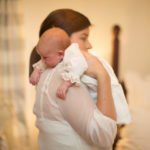 During this important time of your postpartum recovery, the focus should be on your health and well-being of your precious newborn. Let your body heal properly and you will feel and see the benefits. Bengkung belly binding is an ancient Malaysian style of wrapping the abdomen. A piece of fabric, around 3 yards long and about 6 to 7 inches wide, is used to bind the core. 2. Wrap the two ends tightly around your hips and tie a double knot at the base of your uterus, pulling the tail vertically. You will keep the tail vertical and continue to wrap the longer piece tightly around your body and tie it in the front. 3. You will continue this wrapping and tying method until just under the breasts. The wrap should be very tight but not cutting off circulation. You would traditionally wear the wrap all day for the 40 days of postpartum confinement practiced by women in Malaysia. Most postpartum doulas can assist in Bengkung belly binding, and you may also find tutorial videos online. In Alabama, you can contact April at www.branchingoutadvocates.com to purchase a Bengkung Belly Bind and to receive personalized instruction on how to wrap. Here are two options for purchasing popular splints and wraps. exercises along with the splinting. The Belly Bandit is one of the most popular wraps on the market. It is easy to use and widely available. The original wrap is good, and they also offer a bamboo fabric version that is even softer and more comfortable.